A few travellers passing up and down Gaston lane have become somewhat agitated by both the potholes and the activity in a neighbouring field. Despite a number of rather far fetched theories currently circulating, the construction has been put in place to prevent a threatened invasion by marauding amphibians, who are apparently poised to launch an unprovoked attack whenever the weather warms up sufficiently to bring them out of hibernation, assuming, of course, they haven't already been flushed off to Chawton by the winter rain. 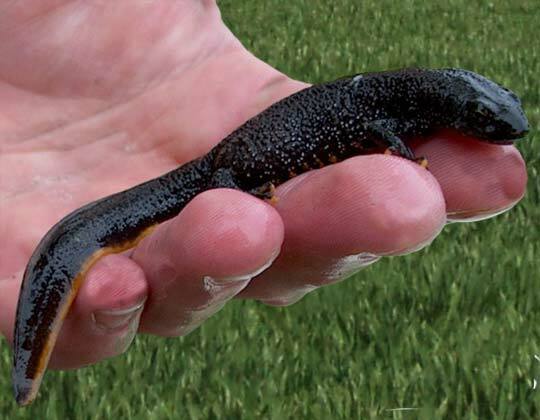 Apparently, the presence of protected amphibians, in this case Great Crested Newts, on the proposed Solar Farm site would, should the scheme ever be approved by the Local Planning Committee, inhibit any construction activity on the site until the little Efts clutter off to hibernate in the Autumn. Just in case you are not on intimate terms with the Great Crested Newt and to give you some idea of the size of the beast, here's one of a group of four, found in a neighbouring parish ditch in 2012. Since countless generations of farmers have been ploughing and cultivating these fields, frequently within the period when any site work is banned, how they have continued to maintain a local population without this protection is a mystery. There is a suggestion that neighbouring residents in Gaston Lane my find their sleep disturbed as marauding bands of anarchist newts throw themselves against the defences in an act of civil disobedience but, so far, there have been no reported incidents to confirm this theory. Incidentally, if you do find one of these animals wandering about, handling one without adequate training and a current Newt Fondling Licence is probably a capital offence.